For the past 8 weeks I've been connecting with and working alongside 17 amazing businesswomen. 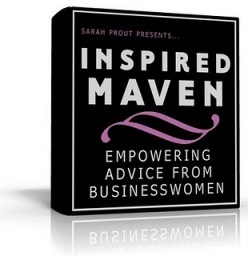 We came together under the Inspired Maven banner created by Sarah Prout - author of The Power of Influence. It's been an inspiration. It's been fun. As it happens whilst being part of this wonderful group I was also completing my study and internship to become a fully qualified Mace Energy Method practitioner. This, as you can imagine, was a huge growth experience for me as part of the training is to have as many sessions as I needed in order to release my negatives and embrace the positives. Through both these experiences I have come to understand who I am and what I offer and made decisions to release some things that were no longer working for me and by doing that I've allowed new ideas, projects and businesses to come into my life. The letting go has been hard but I know that the Universe abhors a vacuum and so some of the empty spaces have been filled, are being filled and if they are still empty they will be filling up soon. The writing and sharing of my own experiences both in life and business and my creative side through published books, e-books, my children's book series 'My Secret Superhero' and my articles are one of the things I have chosen to move ahead with. And so one part of the vacuum has been filled with an inspiring co-creation with my newest friends and fellow Inspired Mavens and it's coming to a blog near you soon. Packed with inspiration and tips, if you're building a business, online or offline or both you will want to get your hands on a copy. The word from the Feng Shui world is that the next two months leading up to the Chinese New Year at the beginning of February are full of power and any project you start during this time will be a success. So now you know - this is really the time to finally start your online business idea and start living your dream. To do it you are going to need some support and what better way than through the experiences and inspiration of Inspired Mavens who are doing the work and getting ready to rock the New Year. To be the first to find out the minute this inspiring book hits our blog sign up to receive The Joyful Attraction Blueprint and to get on our mailing list.